An excel file may contain several sheets. Let us see how many sheets are present in sample.xls file and their respective names using excel_sheets(). Now that we know the number of sheets and their names, let us read data from the ecom sheet of the sample.xls file using read_excel(). We will specify the file name, and the sheet name or sheet number. Notice when you use the sheet name, the name should be enclosed in single/double quotes. The first method uses the cell names along with : to specify the cell range. For example, to read data from first 4 rows of columns B and C, we will specify the range as "B1:C4". To read data from first 5 rows of columns A, B and C, we will specify the range as "A1:C5". 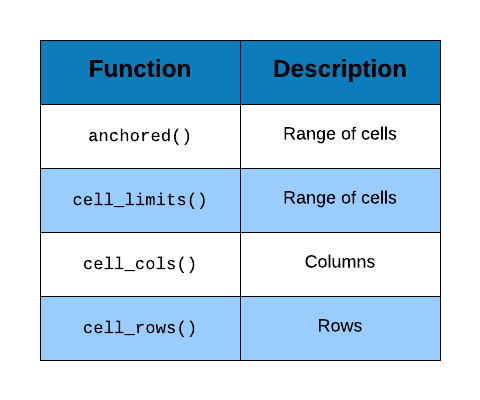 In the second method, we start from a particular cell and specify the number of rows and columns to be covered keeping the initial cell as anchorage. In the below example, we want to read 3 rows and 2 columns starting from the cell A4. When you want to read a subset of rows from the data, use cell_rows() and specify the row numbers or the range. In the below example, we want to read the first 4 rows of data from the file. If you want to read a single column from the data, use cell_cols() and specify the column number. In the below example, we read the second column from the sample.xls file. In case of multiple columns, we need to specify the column numbers or the column range. In the below example, we want to read the 2nd, 4th and 6th column from the sample.xls file. In the next example, we want to read data from the 2nd column upto and including the 6th column.